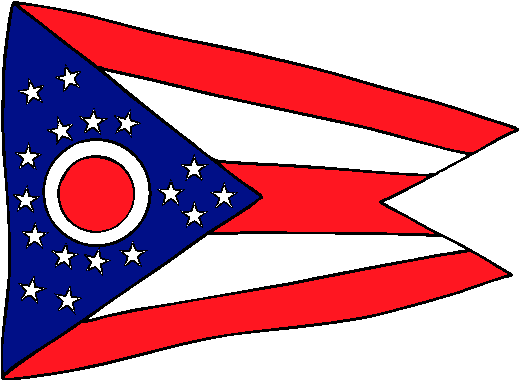 The flag of Ohio is the only non-rectangular flag of any state in the United States. The flag contains a blue triange (representing Ohio's hills and valleys), and red and white stripes representing the state's roads and waterways. THe blue triangle contains seventeen stars (representing Ohio being the 17th state admitted to the Union), and a white circle with a red center (representing both the first name of the state, and its nickname: "The Buckeye State"). The flag was devised in 1902, and designed by John Eisemann, and was inspired by the designs of cavalry flags used in the American Civil War, and the Spanish-American War.